My children love to help me in the kitchen. I am usually willing to have one of them help me, but now that the two-year-old boy wants to be involved in everything, it gets messier and more time consuming and just generally harder to be excited about cooking with kids. But in the spirit of doing the hard things so the hard things get easier, I’m resolved to bake a lot with them this fall season. They love to bake, they love to do what I’m doing, and it’s a valuable skill to have. Plus, it’s like built in obedience school for toddlers–bonus! Since we love to read even more than we love food itself (okay, maybe that’s just me), some of the recipes I plan to make this Fall are found in books. The first is one I baked with my mom and sisters as part of our homeschool curriculum. It’s called Grandmother’s Cranberry Bread from the book Cranberry Thanksgiving. The book is pretty good, but the recipe is mostly what I remember. For someone who isn’t crazy about all things pumpkin (you can keep your pumpkin spice latte, thankyouverymuch), cranberry is the flavor of Fall. I recommend the book, but if you’re not in a picture book stage of life (whatever that means!) you can view the whole recipe on the Amazon website. We’re also going to try Fairy Tale Feasts. I doubt we’ll be finding any stellar recipes, as they all look pretty basic, but I think the kids will really have fun with it. They are especially fascinated by Jack and the Beanstalk, so I foresee some beans in our menu future. And though The Little House books aren’t technically picture books, we’ve already read two of them and we’re definitely try out the The Little House Cookbook. I’ve always wanted to make the molasses snow candy they make in Little House and the Big Woods, but the snow is a little sparse in the deep south. 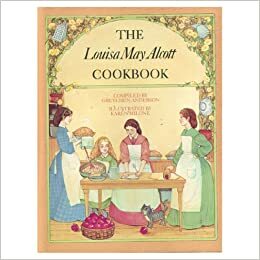 Another recipe book I want to try is The Louisa May Alcott Cookbook. The Honey Pumpkin Pie with Gingerbread Crust looks especially fall-ish and delicious. So that’s what is on our fall baking list, along with this non-bookish recipe for Pumpkin Chocolate Chip Muffins. What’s on your list? oh my word! I LOVE crandberry thanksgiving…which led me to find more bookss by the devlins which are also awesome….but I make this bread for and with my kiddos every year. Sadly mine are growing up too fast and didn’t want to this year….but wow! I thought I was the only one. Previous post Pilgrims or Indians?